Once you have used the coupon maker to customize and create coupons you might want to create a cover in order to make your own coupon book. You can do this using our coupon book template below. Select a coupon template and create a selection of coupons. Either mix and match the colors or make all the coupons in the same color. Do not cut off the flap on the left hand side. Select a coordinating cover. Click on it to open the coupon maker and customize the cover. 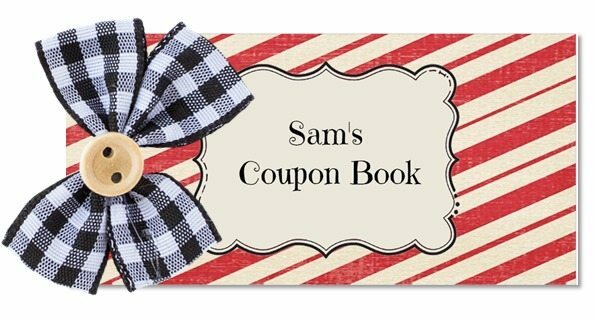 Add a title and a message that will appear on the back of the coupon book. 4. Cut on the solid lines. 5. Fold on the dotted line in the middle (back to back). 6. Insert the coupons into the folded cover. 7. Punch a hole or two or staple together. Make sure that when you bind the book you bind both the cover and the coupons together. If you punch a hole then tie it up with a pretty ribbon. This is a great gift to make when money is tight or when you want to add a free gift for that extra touch. It only takes a few minutes to make and totally looks professional. Print the cover on heavy paper to make it look store bought. You can insert as many coupons as you want so use your imagination and get creative!